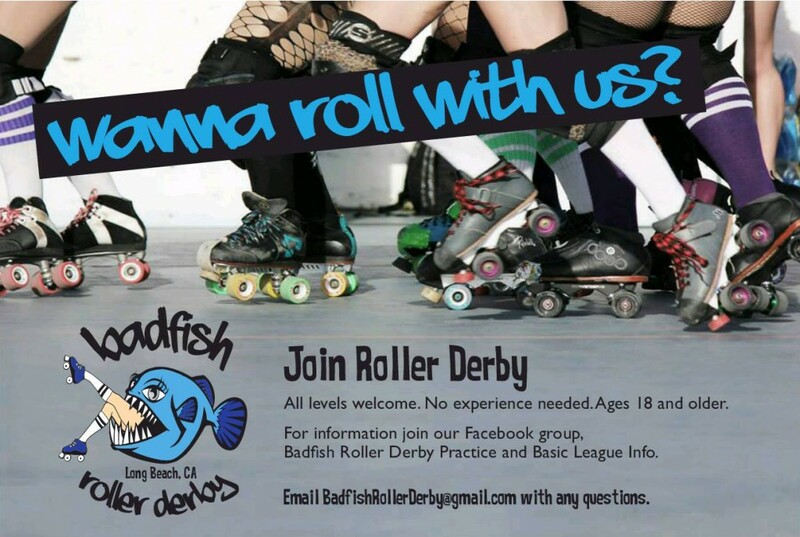 Badfish Roller Derby Recruit Night! OUR NEXT RECRUITMENT EVENT IS SEPTEMBER 12 2014. THIS WILL BE AN INFORMATIONAL MEETING- NO EQUIPMENT NECESSARY. Have you always wanted to play Roller Derby? Here is your chance! Come to Blondies in Long Beach on Friday at 6:30pm Sept 12 and meet the ladies of Badfish Roller Derby. We welcome both men and women skaters and non-skaters to join. We need players (woman only), referees, coaches, and volunteers. Anyone is welcome to come and observe our practices before attending our recruitment events. While some skaters on our team do have years of experience, most of us had not skated for decades (if at all) until we joined roller derby. Even those who have skating experience still need to learn how to skate “derby style”. We teach you everything about derby, from the basics of falling correctly to advanced skills (like whips!). It is never to late to start. Must be 18 years old to play with Badfish Roller Derby.